Registration fee includes a continental breakfast and lunch. ​Call for papers deadline extended to January 5th, 2018. 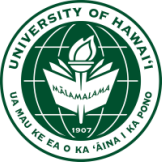 A great opportunity to share your manaʻo & ʻike! Please feel free to share this email with others! access rights, creating boundaries in an archive, and tips on displaying and presenting materials. archives and special collections are successfully made available to populations around the world. digital and “Born Digital” material, and give insight on the curation of online exhibits. (In order to submit a proposal for this panel, you must be a Neighbor Island-based professional). largest city in the State, and continuing education opportunities. Beyond that, the way professionals and repositories from Neighbor Islands are viewed tends to be a bit in the margins. This panel explores the latest undertakings, programs, and projects, as well as some of the obstacles Neighbor Island professionals have encountered along the way and how have they have addressed issues and reframed the "center" with creative techniques and methods in their archives. of your presentation, to Keau George (keau.hps@gmail.com) by no later than January 5th, 2017.
to different islands, and different repositories all over the State! February 17th Come Holoholo on the beautiful Valley Isle and have special access to our colleagues' archival and museum sites and absorb some of the sights and culture of Maui! schedules, are there other types of materials we should not be keeping? Or are there special ways we should be managing a certain type of material? This panel seeks to discuss how repositories, institutions, and organizations deal with culturally sensitive materials, privacy & Access rights, creating boundaries in an archive, and tips on displaying and presenting materials. In spite of differing standards, best practices, and systems used across the digital landscape,archives and special collections are successfully made available to populations around the world. on unique digitization projects and collaborations, discuss processing and providing access to digital and “Born Digital” material, and give insight on the curation of online exhibits. (In order to submit a proposal for this panel, you must be a Neighbor Island-based professional. Travel Stipends, in part facilitated to support Neighbor Island Education and Professional Opportunities by AHA and the Hawaii Council for the Humanities, will be available for these panelists). Neighbor Island professionals face unique challenges with scarce funding, distance from our largest city in the State, and continuing education opportunities. Beyond that, the way professionals and repositories from Neighbor Islands are viewed tends to be a bit in the margins. This panel explores the latest undertakings, programs, and projects, as well as some of the obstacles Neighbor Island professionals have encountered along the way and how have they have Addressed issues and reframed the "center" with creative techniques and methods in their archives. of your presentation, to Keau George (keau.hps@gmail.com) by no later than December 12th, 2017. -AHA will cover each presenters annual meeting registration fee. All other fees associated with flight, lodging, and transportation will be the responsibility of the presenter (See Neighbor Island Panel Exception Above). Affordable options will be listed when the annual meeting registration is opened. Keau George (keau.hps@gmail.com) or Joy Holland (joy@konahistorical.org). Consuelo Foundation Volunteer Saturday information. 1 shift only: 9:00 a.m. - 1:00 p.m.
Nicki Garces has invited SAAsc to get hands on experience at the Consuelo Foundation, 110 N. Hotel St. Chinatown, Honolulu. Please fill out the following form if interested with the days you want to volunteer for.